This week I was invited to meet some of the Southdown sheep from the Nepcote Flock, which provided the prize-winning fleece I bought at the Findon Sheep Fair in September. 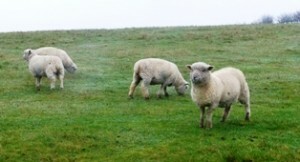 The sheep in the Nepcote flock are owned by Graham Langford, Hari Doman and Martin Rolph and can be seen in several fields around Findon, where they have become part of the village landscape. 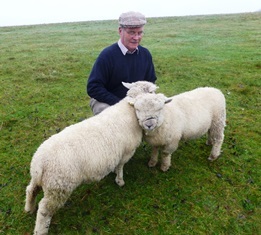 It was a typical English November day – damp and misty with drizzling rain – when Hilary Langford, Graham’s wife, took Louise (of Southdown Yarns) and me to the field where some of their Southdown sheep are kept. 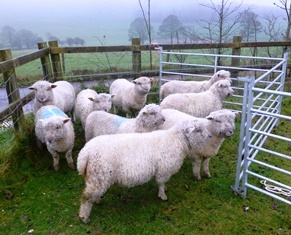 Graham had kindly put some of their sheep in a pen, so we could see them at close quarters and inspect their fleeces, which were remarkably clean and looked as if they could be ideal for handspinning. The sheep we met were this year’s lambs and some of them are used to being led on the halter in preparation for the show ring. so they seemed quite content to be admired and stroked. 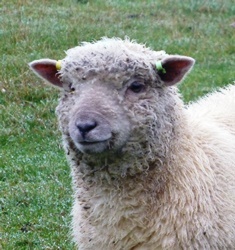 It was so quiet and peaceful in the field with the sheep that no-one seemed to mind getting wet. 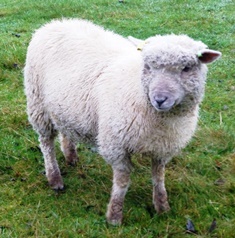 Southdown sheep are relatively small and particularly appealing, with their woolly faces and legs. The wool of the Southdown is among the finest wools of the British breeds and it is used for a wide range of high quality fabrics, including hosiery, hand-knitting wools, dress fabrics and lightweight tweeds. This shows some of the Nepcote Flock penned ready for us and interested in inspecting their visitors. From the directions in which they are looking, it is easy to guess where we were standing. Graham is holding the halters of two of the sheep, which stood patiently nuzzling one another for nearly an hour while we admired them and inspected their fleeces. Our presence was noted by one of the unpenned sheep, which came over to greet us. I hope that when the sheep are shorn I will be able to purchase some fleeces for handspinning. Last year I bought a second-hand, but unused, Barnett drum carder. Thanks to Louise Spong of South Downs Yarn and her eagerness to see the effects of drum carding on Southdown fleece, I was given the necessary incentive to get the drum carder set up and at last I have finally got round to trying it out on the prize-winning local Southdown fleece I bought at Findon Sheep Fair.. The drum carder in action. I think I may have introduced too much fleece at once onto the drum. This would be typical of my rather impatient nature, I fear! 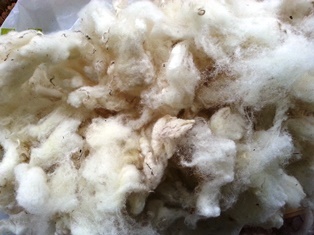 Batts from the drum carder ready for spinning. They are probably not the best carded batts ever produced and should, I think, be smoother and finer. 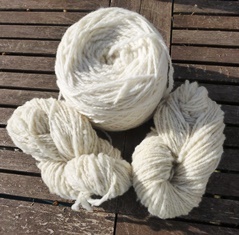 These skeins have been handspun from the drum-carded Southdown fleece batts above and the ball of wool was handspun from commercially-produced Southdown tops. I suspect I need to practise more in order to produce better batts, as better batts should produce a more even yarn with fewer lumps and bumps – unless one wants lumps and bumps, of course. I have become quite enthusiastic about Southdown fleece. 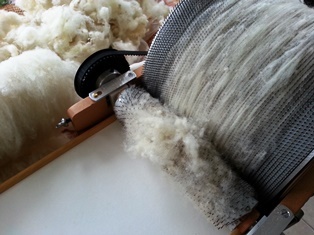 Although the staple length is usually fairly short, carding produces fleece which can easily be handspun and produces a yarn which is soft, lofty and bouncy. 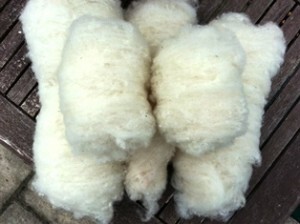 Other advantages of yarn from Southdown fleece are that it dyes extremely well and it doesn’t tend to felt or “pill”. I get particular pleasure from working with fleece from the sheep which have for centuries roamed the South Downs near my home in Sussex, especially when I can buy local Southdown fleeces from the sheep I can see in the fields around my village.